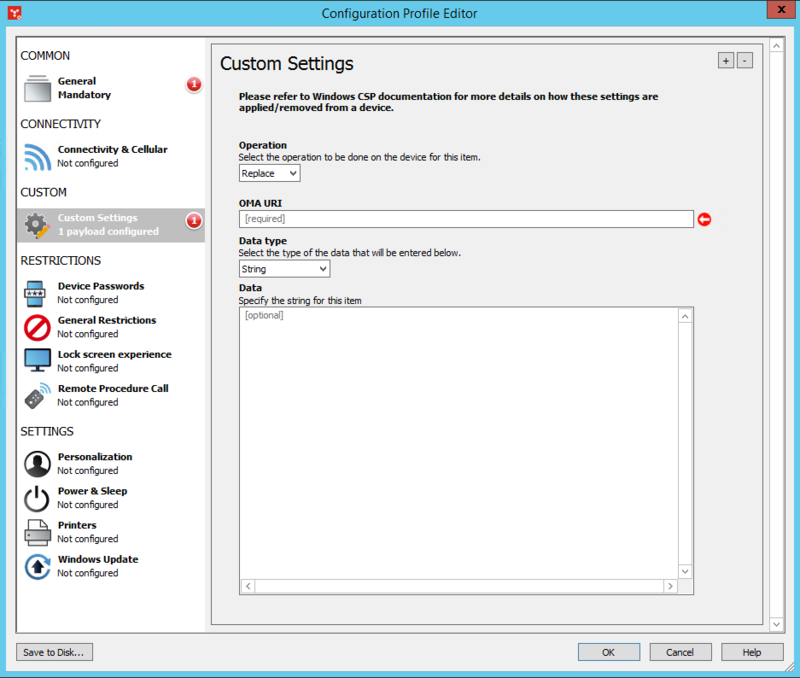 Use this page to configure Microsoft configuration service profiles (CSPs) with the configuration profile editor. For more information about the configuration profile editor, see Agent settings: Configuration Profile Editor. Email2: Configure simple mail transfer protocol (SMTP) email accounts. 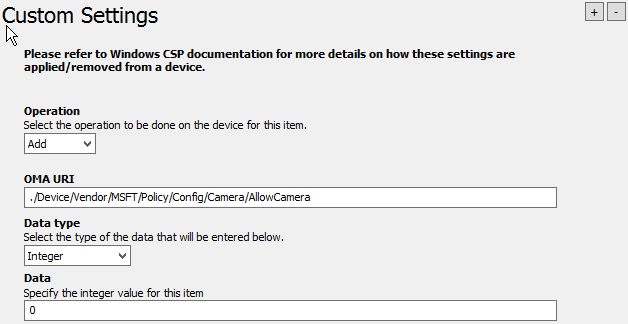 Windows Encryption: Configure Windows CSP BitLocker policy. Connectivity and Cellular: Configure connectivity settings such as cellular settings, Bluetooth, and Wi-Fi. Custom Settings: Add custom CSPs for items that aren't directly available in the Windows MDM Configuration agent settings. Device Passwords: Configure password settings. General Restrictions: Configure general restrictions such as location, camera, gaming service, and telemetry settings. Lock screen experience: Configure the lock screen settings. Start: Configure task bar settings and what will appear in the Start menu. Accounts: Configure if the user can add accounts and which domains are allowed to sync email on the device. Kiosk: Configure the kiosk mode login and what app will run. Personalization: Set background and lock screen images. Power & Sleep: Configure power settings for when the device is plugged in or on battery. Printers: Add approved printers to the device. Windows Update: Configure how the device will receive security updates and other downloads through the Windows automatic updating service. Administrators can access this editor only if the Modify Mobile Device Configuration Profiles option has been activated for their account. Operation: Either Add, Replace, or Delete. OMA URI: Open Mobile Alliance Uniform Resource Identifier. Use the Microsoft Configuration Service Provider reference to identify the syntax for the CSP you're creating. Data type: Match this with the data type that your OMA URI requires. Data: The CSP value. This must match your selected data type. You can add multiple custom settings by using the + and - buttons. Plus adds a new setting and Minus deletes the current setting. When you have more than one custom setting configured, use the scroll bar to view them.